Ukraine’s ex-PM Yulia Tymoshenko has been caught in a leaked taped phone call with parliamentarian Nestor Shufrych, talking about it is “time to go grab guns and kill those damned Russians with their leader,” so that “not even scorched earth will be left where Russia stands”. Translations also capture Yulia Tymoshenko as saying she would “like to grab a machine gun and shoot that motherf***er in the head”. According to the Moscow Times, the recording, apparently made March 8, details a conversation between Yulia Tymoshenko and Nestor Shufrych from Ukraine’s National Security Council, and has Tymoshenko suggesting that Ukrainians should kill Russians, and, in particular, Russian President Vladimir Putin. 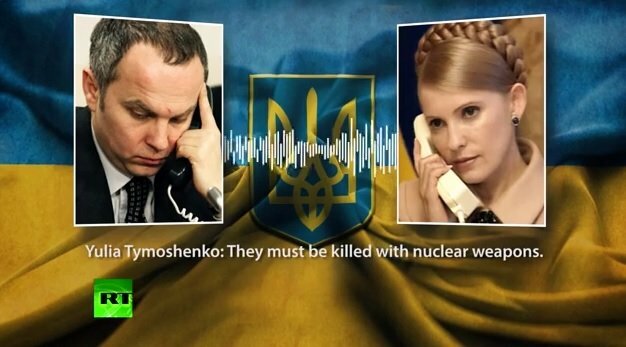 The recording, which may have been altered, also apparently features Yulia Tymoshenko suggesting that the 8 million Russians living in Ukraine should be killed with “nuclear weapons”. The video containing the recording was initially uploaded to a YouTube account under the name Sergiy Vechirko, and has since been widely shared on pro-Kremlin media outlets. While the Moscow Times reports that Nestor Shufrych has denied the recording is real, a tweet from Yulia Tymoshenko appears to suggest she believes at least part of it is real. In her tweet, Yulia Tymoshenko says that the recording has been edited, and that she in fact said that the Russians in Ukraine “were Ukrainian”. She also added: “Hello FSB :)” in reference to Russia’s security agency. Yulia Tymoshenko, widely considered a potential candidate for the Ukrainian presidential election in May, does not have a reputation for being anti-Russia, which has struck some as strange, and had enjoyed a working relationship with Vladimir Putin in the past.